The search for a cheap but powerful player in FIFA 16 Ultimate Team is quite tricky. The offer in the transfer market is huge - almost every minute will be added new kicker. We take you from hours of work and search: Our guide shows cheap, but quite strong and fast players from the Bundesliga. We have created three lineups for the categories bronze, silver and gold. After all teams, which consist exclusively of Bronze, Silver and Gold players, enable participation in special tournaments in FUT. For some competitions Bronze, Silver or Gold Teams are required. There waving lots of coins when you win the tournaments. The earned money you can finally invest in better players. The following teams are composed of inexpensive players - usually they are considerably cheaper than 2,000 coins. In addition, we have placed great emphasis on the speed of the individual Kicker. We recommend: Keep the transfer market of FIFA 16 FUT out for the players and watch the price curves. In the morning they are at best; evening prices are rising because more players are online. The same is also true for bronze and silver teams. Note that the current trading situations in FIFA 16 reflect the following teams. Ransack the catalog on a regular basis for further, cheap players. Once you have created your first teams you should save for buying their coins. Then you can rotate the preparation and let regenerate exhausted players. Collect more coins in order to buy better players for each position. With any luck, you'll get a star kicker when you open a card pack. Unnecessary Player gives the transfer market to buy free - and thus deserve more coins. 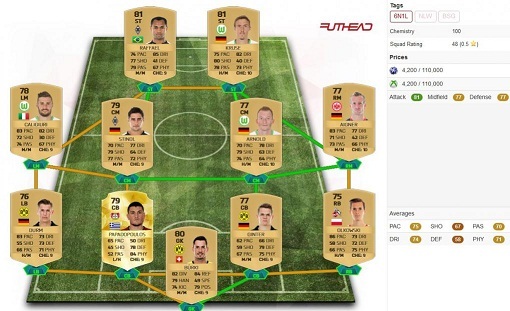 Cheap Gold team players in FIFA 16 FUT: Our team consists exclusively of Bundesliga -kickers with a focus on speed. One of the goals in FIFA 16 Ultimate Team is to create a strong team with as many gold players. With this team you are entering a priority in single player and multiplayer duels. At the beginning - when the coins account is still quite clear - you should keep your eye out for cheap and quick players. For the subsequent team we paid attention to the following factors: price, speed and league. 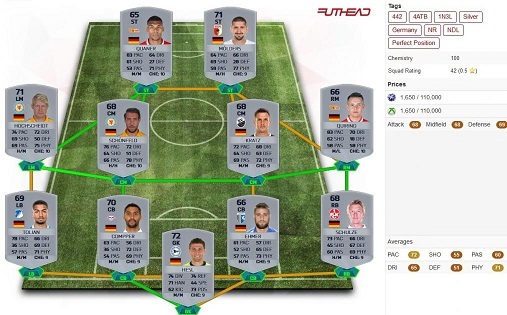 Because all players kick in the Bundesliga, the chemistry value increases to 100. The connections between the individual players are in our starting line, not all green and therefore not perfect. For starters, this is not a problem. Pay attention when buying other players: nationality, club and league match - two of which must be the same, so that the line between two players dyed green. Also note the formation: Our team is playing in the 4-4-2 lineup. Set the player only on their actual positions. Otherwise, there are deductions from the chemical. With a consumer card from the transfer market, the position of an individual player modifies. So that you can develop into a bona fide striker as a midfielder. The prices for Gold players in our team will be a maximum of 2,000 coins - but often much lower. Addiction in the transfer market specifically for the players and keep the prices of courses in the eye. Beat with a good offer. At best, it is in the morning, then very few players online. Tip: Pay attention when buying on the current fitness levels of the player. The basement, must use their circumstances or a fitness card. Buy some cheap substitute added gradually, so you can rotate the preparation and regenerate exhausted players. Addiction in the transfer market specifically for players who fit into your virtual wallet. The following players offer (up to 2,000 coins): Drobny, Hazard, Hasebe, Oczipka, Weidenfeller, Schmelzer and Holtby. Who will quickly collect coins in FIFA 16 FUT, should also create a Silver team. Because there are quite a few tournaments that require as a condition of participation a Silver team. Why would you play there? Simple: In the limited silver Teams competitions you collect a lot of coins. The advantage: The majority of the silver player can earn on the transfer market for small money. The output for the team coins can be quickly recouped. Seek to identify the players and do so together your silver team. Again, we have placed a priority on speed value. The following players offer (up to 1,000 coins): Cherry, Bauer, Schuppan, Hübner, Appiah and Esser. Have you earned enough coins with the first team, you buy in the transfer market targeted better players for each position. In addition to gold and silver tournaments waiting in FIFA 16 FUT also competitions on that you are allowed to deny only with bronze teams. Again waving lots of coins as profit. The Bronze players are the best in comparison with the silver and gold cards. For our team, we have paid particular attention to the speed of each player again. For all players Nationality and league affiliation are identical. Therefore, both the chemistry value to 100 as well as individual lines are highlighted in green - perfect! 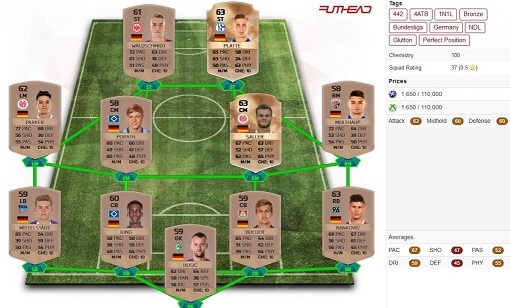 Pay attention also at the bronze team that you have on the bench enough substitutes to replace exhausted players. The following players offer (up to 1,000 coins): Heuer Fernandes, Zenga, bollards Beck, Ristl, Köpke and Holtmann.